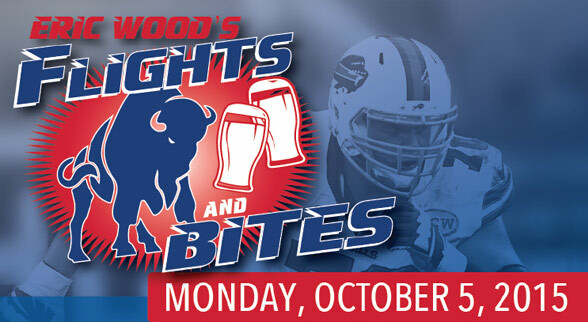 Buffalo Bills’ center Eric Wood will host a Flights and Bites event at Big Ditch Brewing Company on Monday, October 5 to benefit the Eric Wood Foundation, whose mission is to provide seriously ill, special needs and physically challenged children throughout Greater Buffalo with daily encouragement and life-changing experiences. Sponsorships and tickets can be purchased online at ericwoodfoundation.org. Single standard tickets are available for $50 per guest, while single premium tickets are $100 per guest and include a football for celebrity autographs. All tickets include a flight card and endless bar food as well as tax and gratuity. Outside memorabilia is prohibited and guests must be at least 21 years of age. For more information about the Eric Wood Foundation and Flights and Bites, or to purchase sponsorship packages and tickets, visit ericwoodfoundation.org.